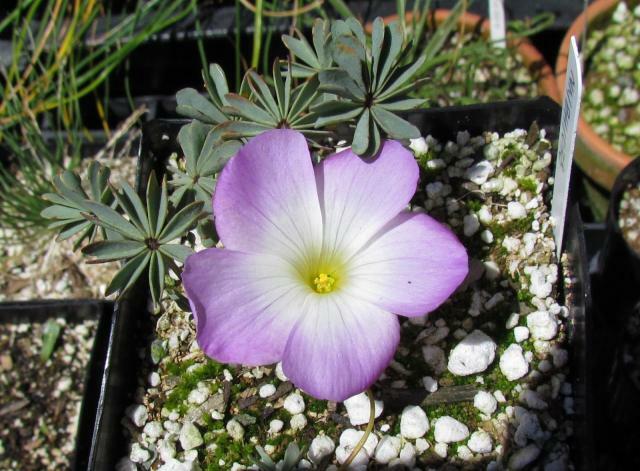 Oxalis adenophylla is from Chile and Argentina where it grows in tallus slopes that are covered in snow in winter. 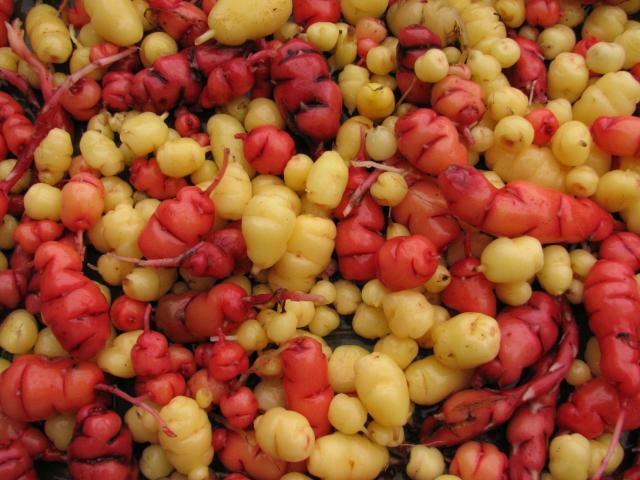 It is one of the more widely grown South American species and have even been used in various hybrids. 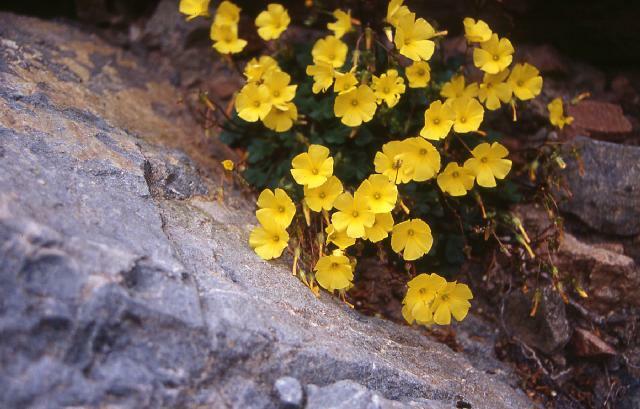 This species is often grown by alpine enthusiasts because it likes a cool summer and is a good plant for rock gardens. It goes dormant when the temperature gets too cold or too warm. Growers from areas with warm summers and cold winters notice that they only grow in the autumn when temperatures are cooler. 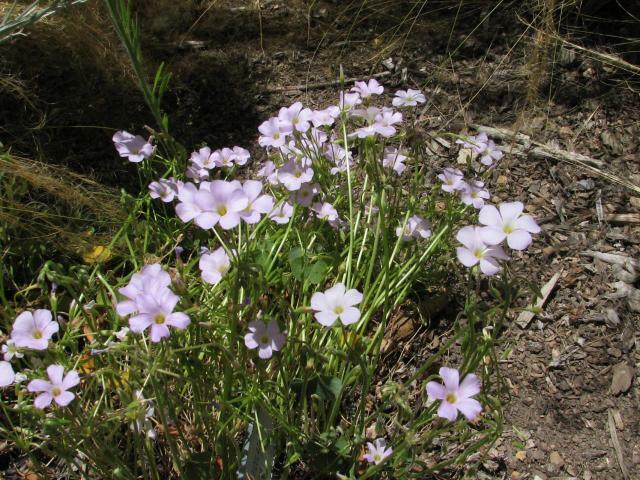 In more mild climate such as the west coast, they grow in spring and summer. Jacek Zwoliński in Poland noted that it survived in the ground when the temperature was -30 °C for 2 weeks. Snow cover is probably necessary for protection in climates that have long and cold winters. 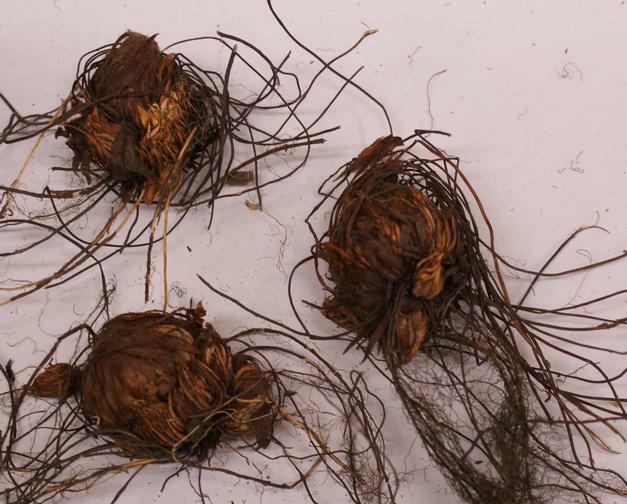 The general recommendation is that the bulbs be dug out in winter and stored dry, although those who live in moist winter areas have been successful leaving them in the ground when grown in well-drained soil. Ornamentation using leaves of the style of this or another South American species can be seen in the Cathedral of Our Lady (Luxembourg), a Jesuit church built in 1621. 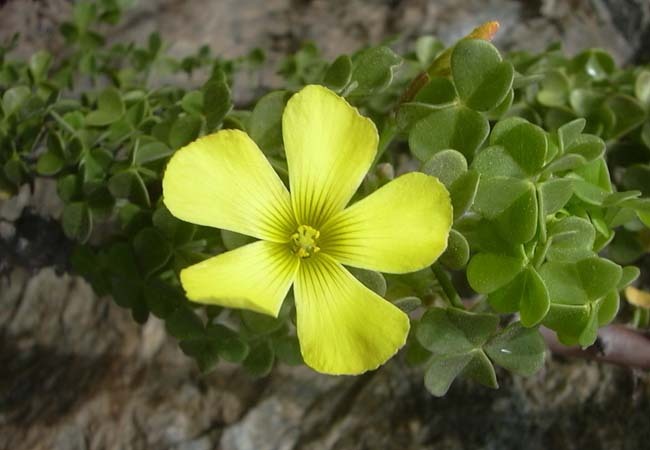 The Jesuits had by then been to Chile and knew about Oxalis. The symbolism may be that the six leaflets stand for the six Christian compassions, one of which is "feed the hungry" and Oxalis is edible. Photos 1-2 by Bob Rutemoeller were taken May 2004 in Ian Young's Scotland garden. This is a particularly nice form with a dark center. Photos 3-4 were taken by Nhu Nguyen of a form from Neuquen, Argentina. 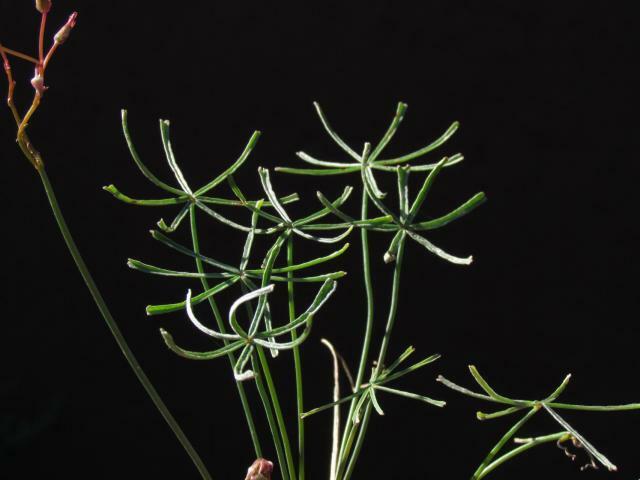 Photographs by David Pilling of bulbs (which are about an inch across) bought in a supermarket and the resulting plants. 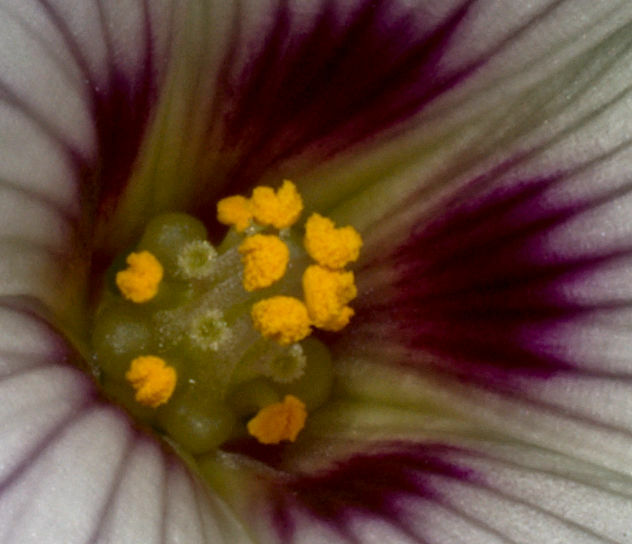 Photo 2 confirms the botanical description of this genus as "obdiplostemonous": there are twice as many stamens as petals, and they are arranged in two rings with the outer ones opposite the petals. Pictures of leaves, mostly from the back because it is easier to count the midribs. 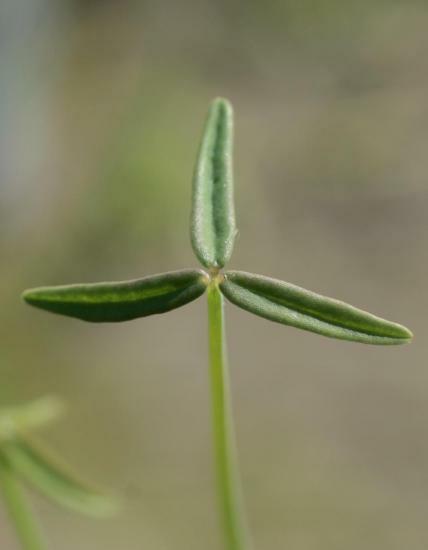 Leaves typically have 7 to 9 leaflets. 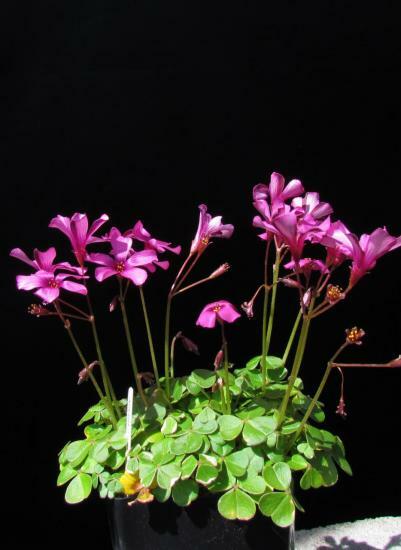 Time lapse video by David Pilling, of Oxalis adenophylla flower opening and closing between 1pm and 6pm on the 15th April 2014, as greenhouse temperatures rose and fell. 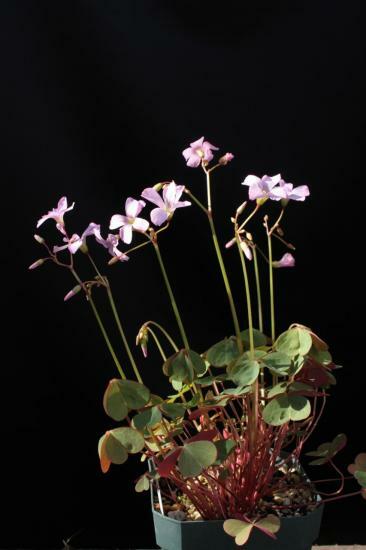 Oxalis articulata see the Oxalis articulata page. Representative photos of this species. Photos were taken by Nhu Nguyen. 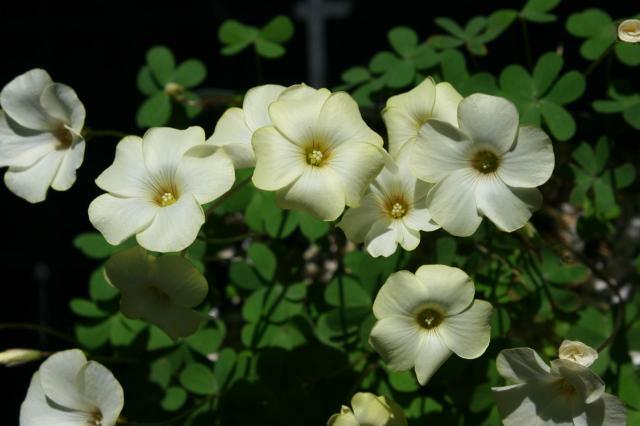 Oxalis brasiliensis is a mat-forming species from eastern Argentina, southern Brazil and Uruguay in dry rocky or sandy soils. 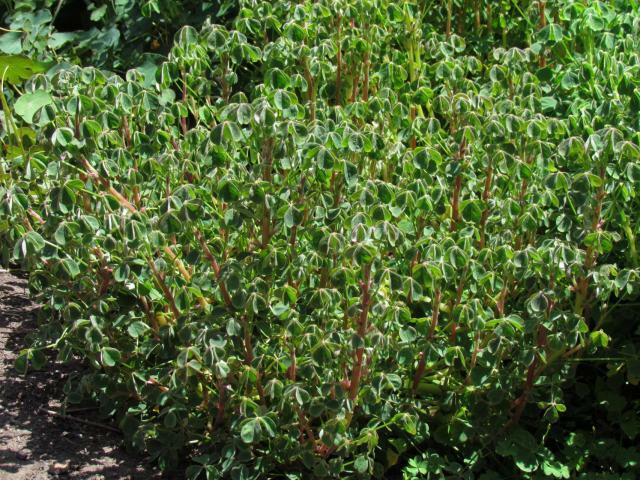 It has also naturalized in southern Australia, which is not surprising considering it's vigorous habit. 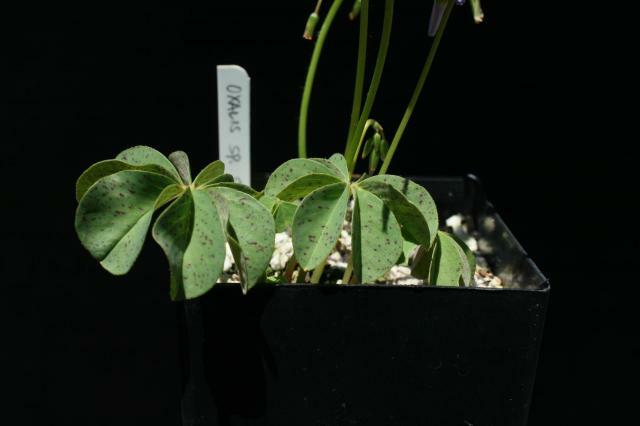 A diagnostic feature of Oxalis brasiliensis is that the bulb has a thin tunic and each bulb scale has 5 or more parallel nerves (related to many of the Mexican species such as O. magnifica) and the flowers have darker lines on the back of each petal. 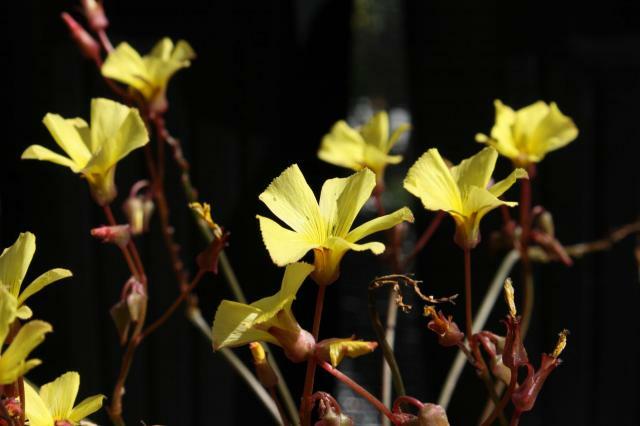 The plant acts as a winter grower in Mary Sue Ittner's coastal northern California garden. 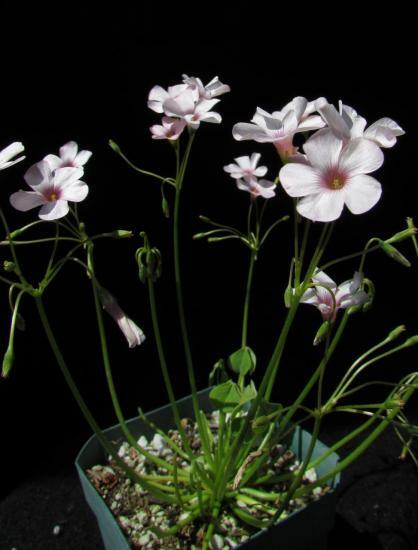 It has a short dormancy late summer-fall and then grows again when it starts raining blooms in the spring. It multiplies rapidly and Mary Sue has only grown it in a pot. In the ground with regular water it might make an interesting ground cover, but also might be invasive in the right climate. Photos 1-2 were take by Bob Rutemoeller and photo 3 was taken Mary Sue Ittner. Photos 4-6 were taken by Nhu Nguyen. 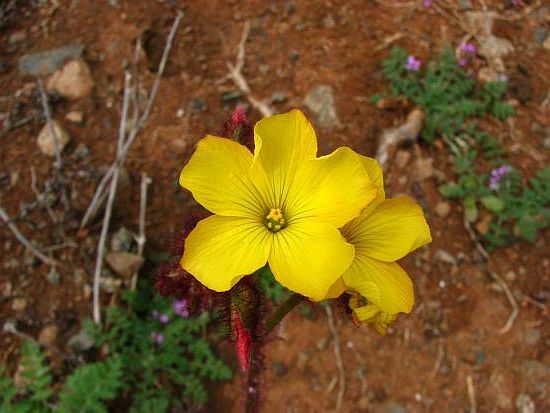 Oxalis bulbocastanum is a species native to coastal northern Chile, where it grows in rocky, sandy soil in a climate that is extremely arid but experiences frequent fogs (called "camanchaca"). 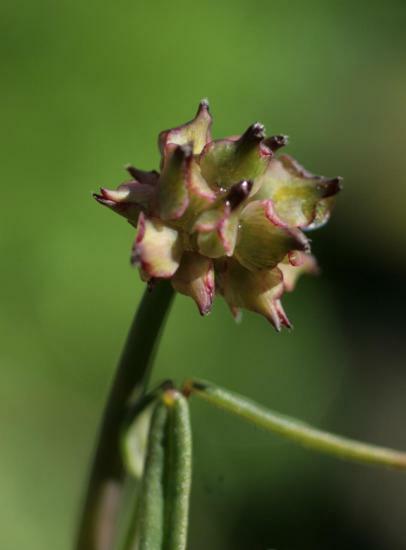 This plant was photographed by Jane McGary in a canyon near Paposo, just north of Taltal. 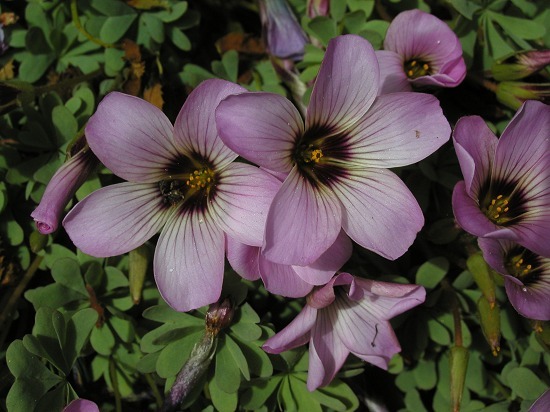 Oxalis enneaphylla is from Chile to Tierra del Fuego, Argentina and also found on Islas Malvinas (Falkland Islands). 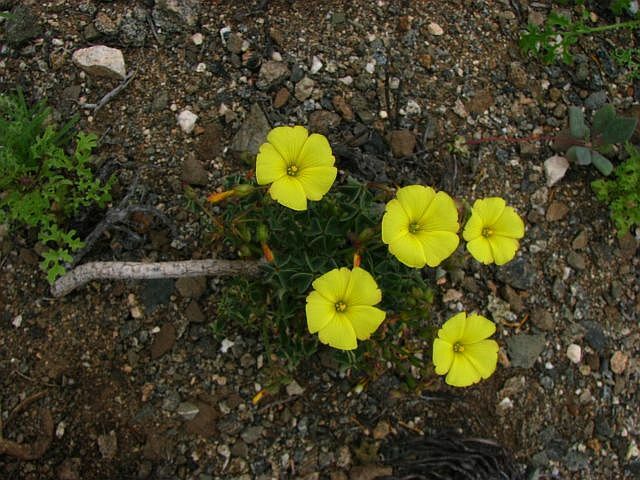 Plants are found on sandy and rocky soils. The flowers are white to rose lavender with deep purple veining and pleated grey green leaves. 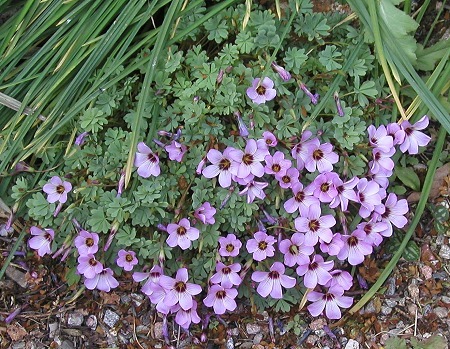 There are many cultivars of this species, often grown by alpine enthusiasts. 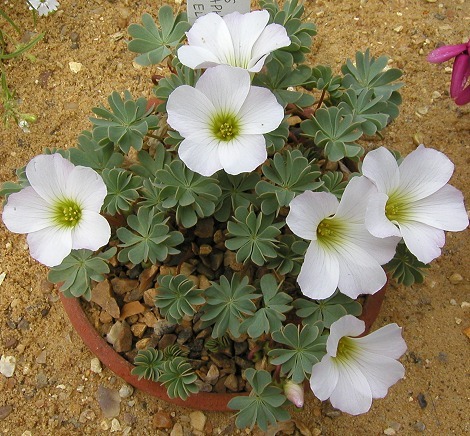 Oxalis enneaphylla 'Lady Elizabeth' This cultivar was blooming in the Alpine House at Wisley Gardens, U.K., May 2004. Photo by Bob Rutemoeller. 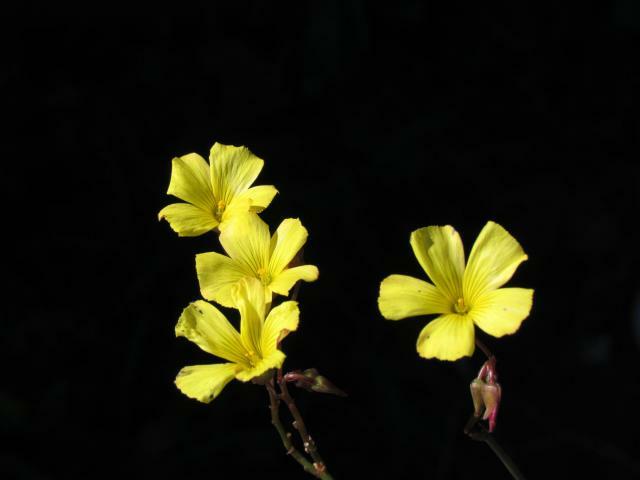 Oxalis floribunda is from southern Paraguay, Southern Brazil, Uruguay and Argentina. The species is uniform, without much variation. 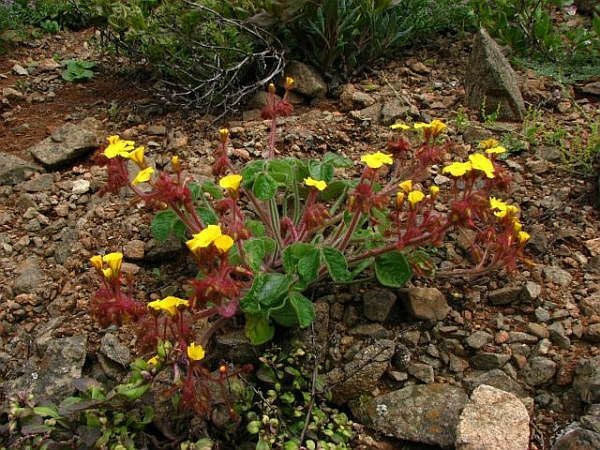 In the wild, plants can be found in rocky outcrops or in between stones in fields. Plants can be distinguished from the very similar O. articulata based on the fine, wooly and tomentose hairs on the leaves. 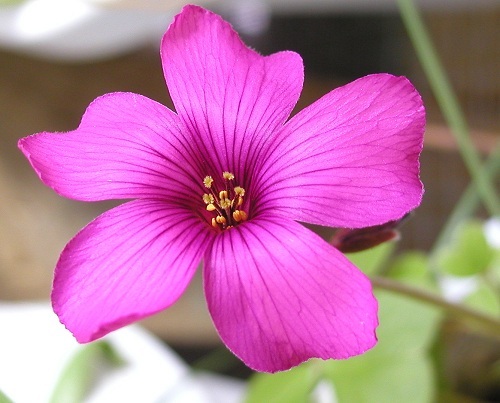 The flowers can be either violet or pink. 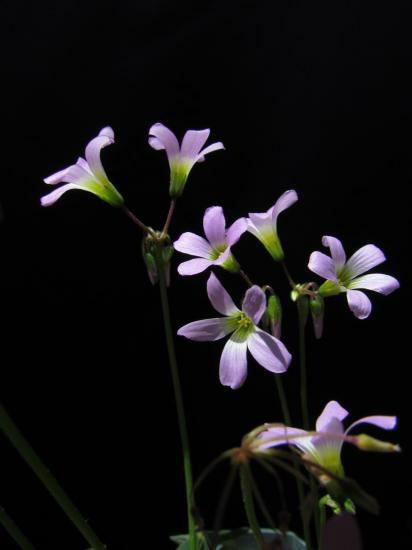 This species is rare in cultivation, and the more popular plants labeled as this species are often O. articulata. 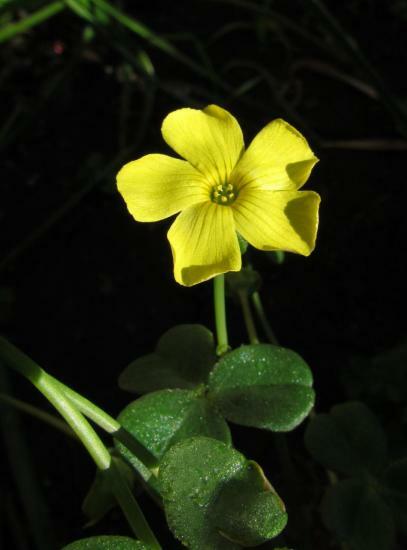 Oxalis floribunda ssp. floribunda has 3-4 linear oxalate deposits on the sepals, sometimes bifurcating. Petals with some areas of fine pubescence. 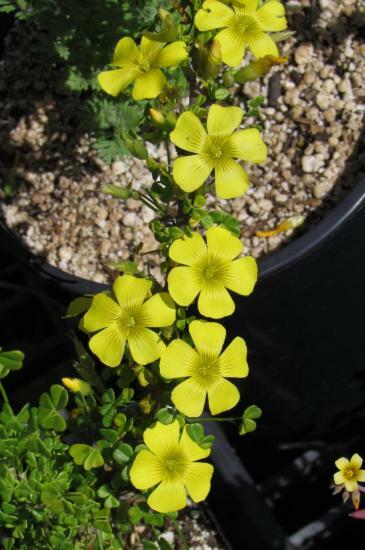 Oxalis floribunda ssp. ostenii has the same characters as ssp. floribunda except that it has more glandulose hairs, making the plant more sticky. 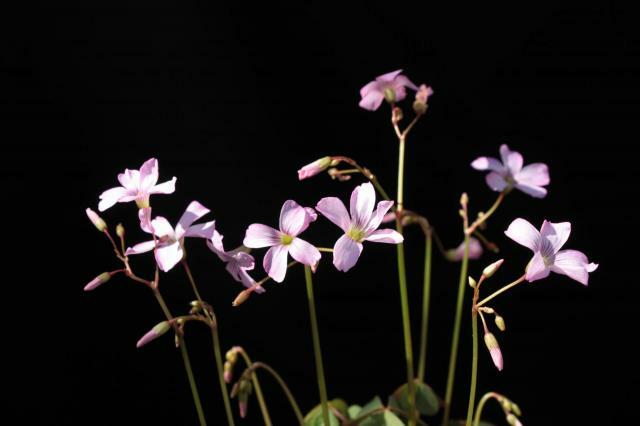 This subspecies can flower twice during the year, the first time in spring and later in autumn. In the spring flowering, the flowers precedes the leaves, but in the autumn flowering, both leaves and flowers appear together. Photos 1-2 below were taken at the UC Botanical Garden by Nhu Nguyen in August 2008. 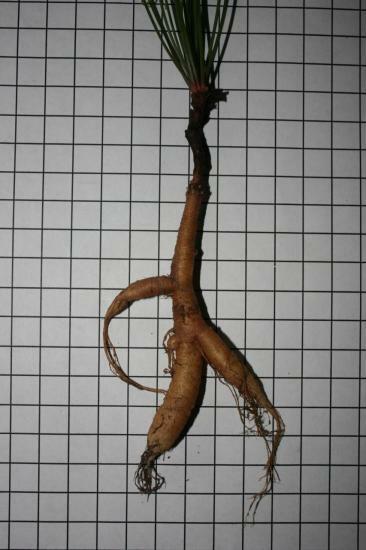 Photo 3 was taken in October, showing the massive rhizomes. Photos by Nhu Nguyen. 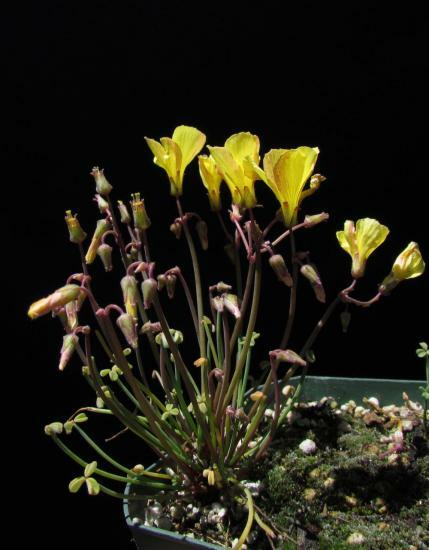 Oxalis gigantea is from Chile and is one of the two largest Oxalis species. 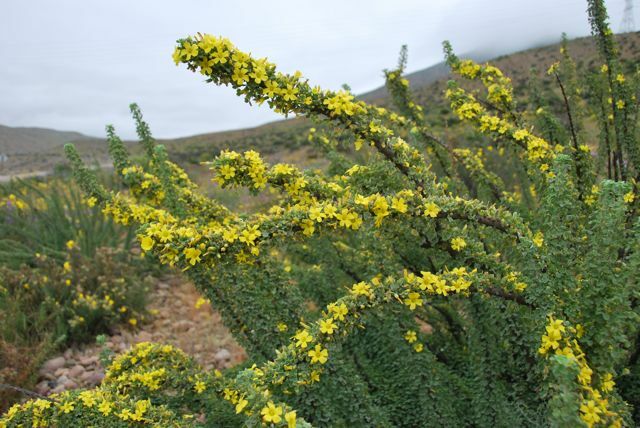 It is shrubby and tall from 1 to 1.7 meters with yellow flowers in spring. In habitat, the leaves drop during the drier summer period and plants go into dormancy. 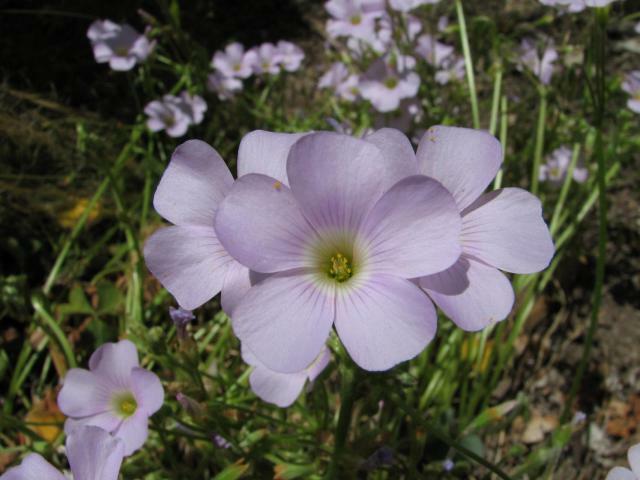 This species is easy to grow in areas with cooler Mediterranean climates. In warmer climates, watering must be controlled very carefully. 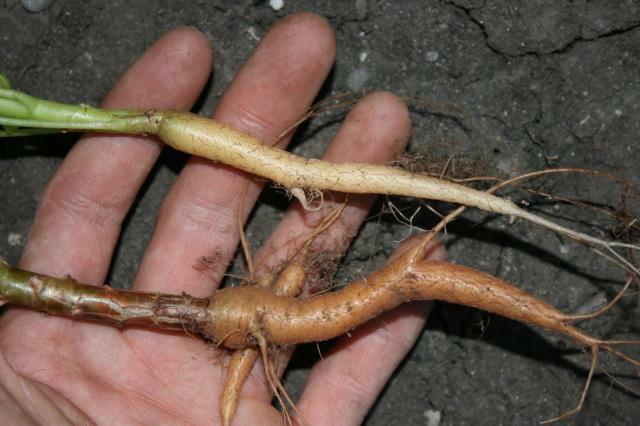 Plants will often outgrow their containers because of the thick root system. Normally, it is a winter and spring grower, and in times of less water will drop all of its leaves. However, if kept watered, it will hold on to the leaves year round. 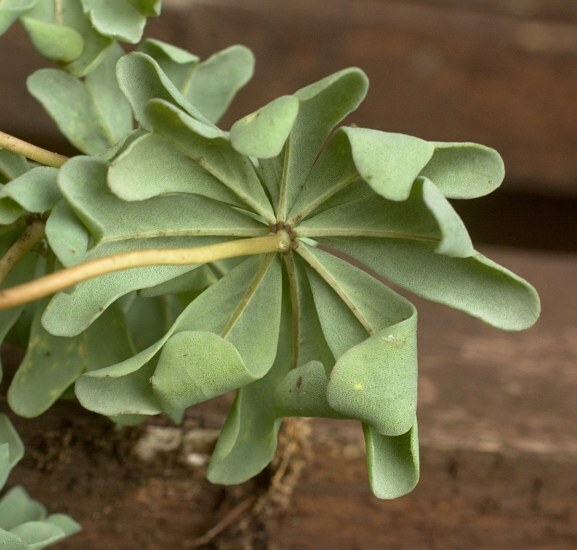 Cuttings can be made with success when plants start to flush out a new set of leaves in winter. Once the plant goes dormant, the cutting will sit until winter arrives again before leaves will appear. Full sun is a must to keep the stem from becoming weak, lengthy, and structurally convoluted. Photo 1-2 were photographed by Diane Whitehead near Huasco, Chile at the end of September 2011. Photo 3 was taken by Eugene Zielinski along Route 5 between Los Vilos and La Serena. 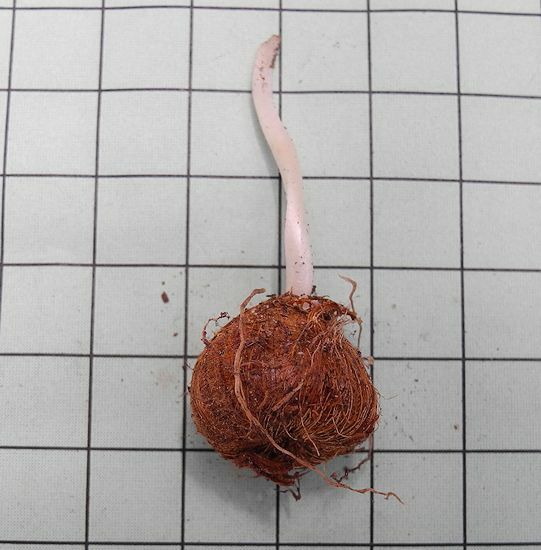 The photos below are of plants in cultivation. Photo 1 was taken by Osmani Baullosa. Photos 2-4 were taken by Nhu Nguyen. 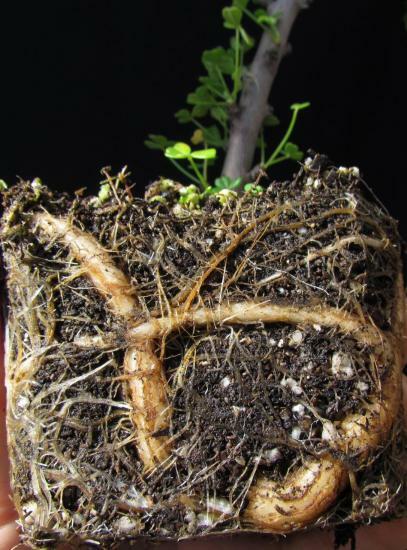 Photo 4 shows the root system of the species in a small pot. In the ground, this root system would have developed very strongly and deeply in the ground. 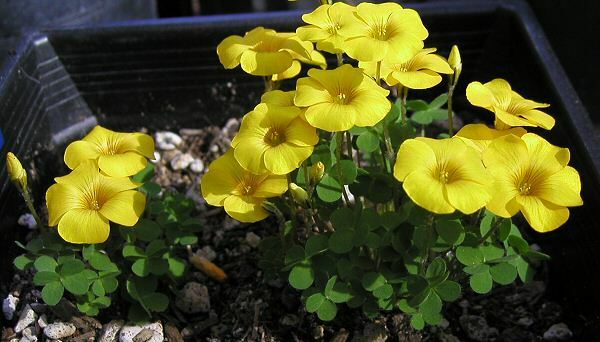 Oxalis 'Ione Hecker' is a hybrid between Oxalis laciniata and Oxalis enneaphylla. 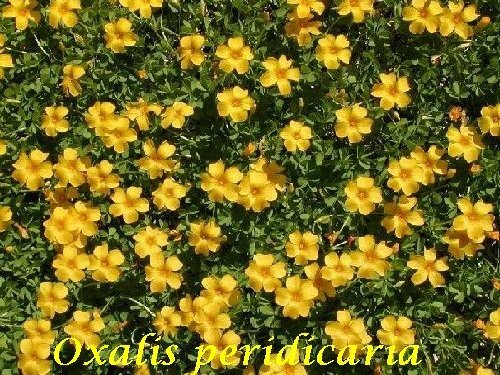 It is fully hardy, as are most of the South American oxalises, but has a tougher constitution than others. 'Ione Hecker' has withstood years of neglect and abuse that have killed a good many other South American forms (Rodger Whitlock). Photo 1 by Rodger Whitlock show plants that have recently been repotted into a soil mix rich in pumice and it is thriving. Photo 2 was taken by Liz Waterman. 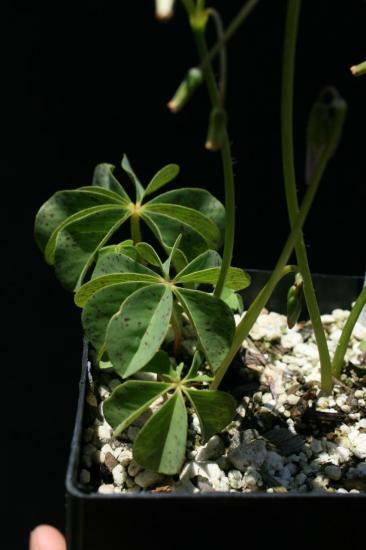 Oxalis latifolia is native to a very broad range from the southwestern US south to the tropical Andes, Antilles to Bolivia, up to 3000 m in altitude. Because of such a broad range, a number of subspecies have been described. 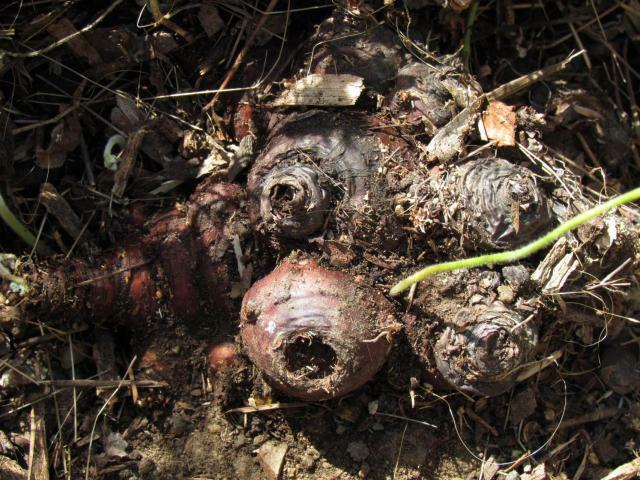 The photo below from Janos Agoston is of the bulbs. 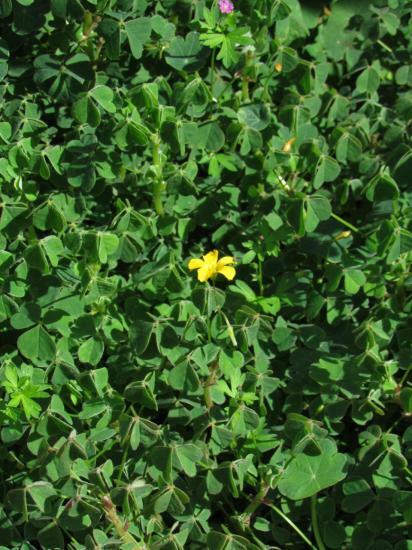 Oxalis latifolia ssp. vespertilionis is native to the Mountains of southern Mexico and Guatamala. This species is summer growing and needs a dry winter dormancy. Photos by Nhu Nguyen. 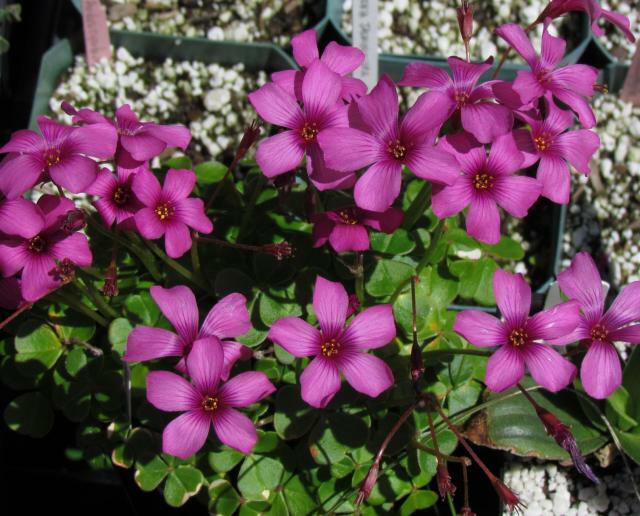 Oxalis megalorrhiza is native to the Pacific slope of Chile and Peru. The species is summer growing and winter dormant. 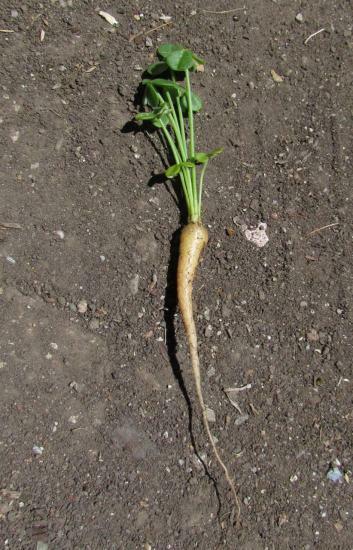 Within a single season, a seedling can produce a very thick taproot, much like a carrot. 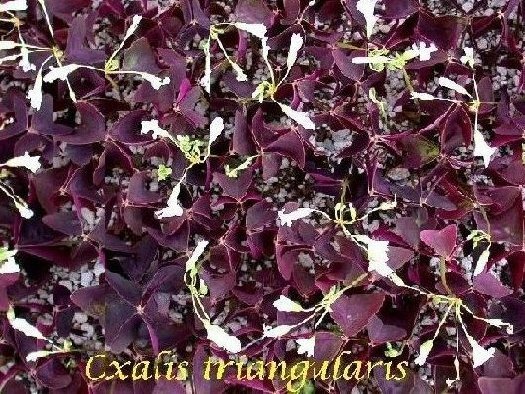 It is one of the few Oxalis species that is self fertile and as a result can spread in a collection. Caution should be used when growing this easy to cultivate species. Photos by Nhu Nguyen. 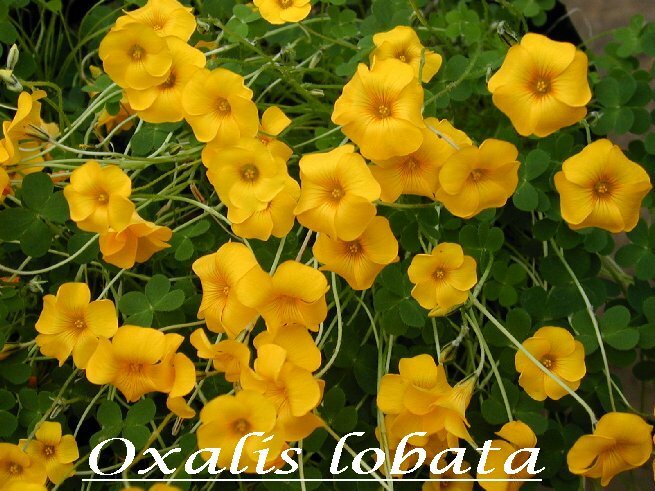 Oxalis novemfoliata is native to a small region of the Atacama desert in central Chile known as "Falda Verde". The species was described in 2008. So far, the authors noted that there had been four collections, all within the type locality. The leaves are palmate with linear leaflets. The number of leaflets are often 9, seldom 12. 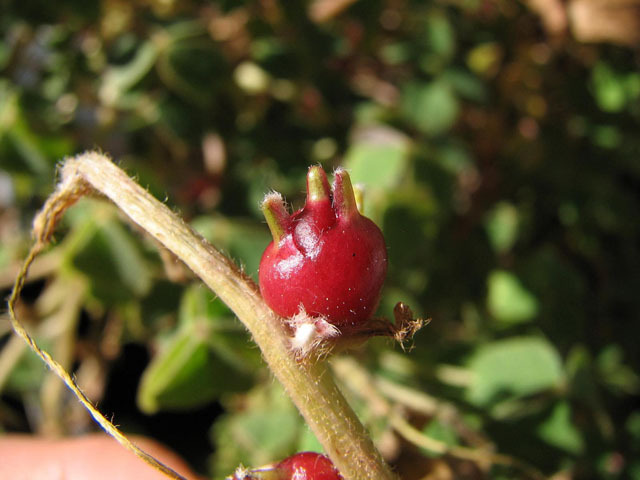 The photos below were taken by Nhu Nguyen of a plant originating from near Pan de Azucar with 7 leaflets. Other than that, the other characters matched very well with the description of the species. 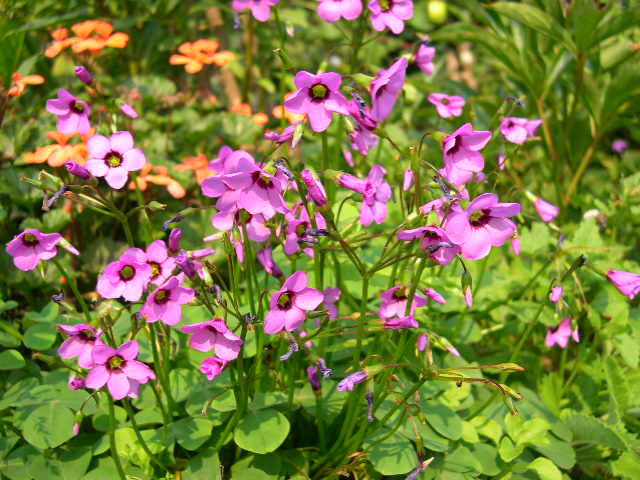 Oxalis perdicaria (syn. 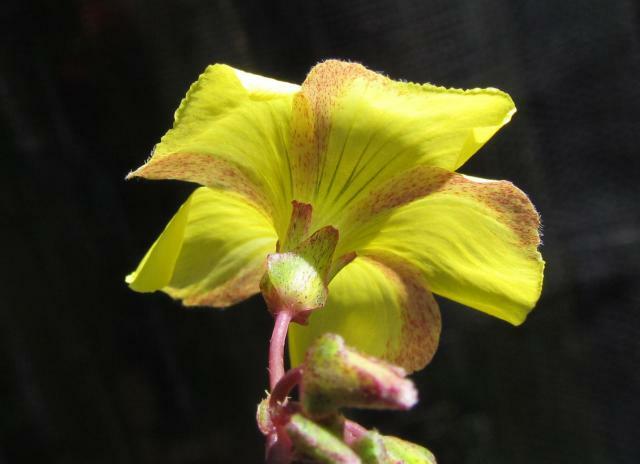 Oxalis lobata) is native to eastern Argentina, southern Brasil and central Chile, in humid fields where it sometime produces a spectacular show. Plants that previously went under both of these names are now thought to be different forms of the same species. According to Clifton, 2004, (see References), the name O. lobata was published in 1823 and the name O. perdicaria in 1833. 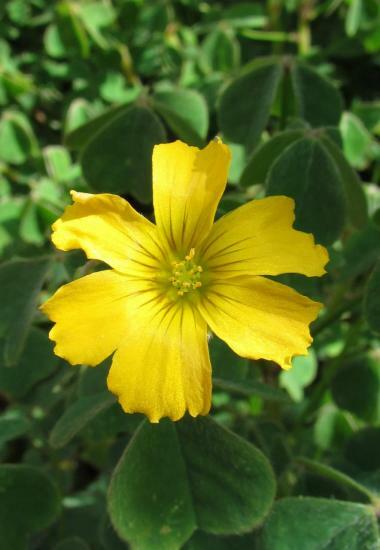 However the RHS Advisory Panel on Nomenclature & Taxonomy in June 2007 is recommending using the name Oxalis perdicaria. It makes sense to preserve the name perdicaria (from perdiz = "partridge") because of cultural importance where the plants are native. 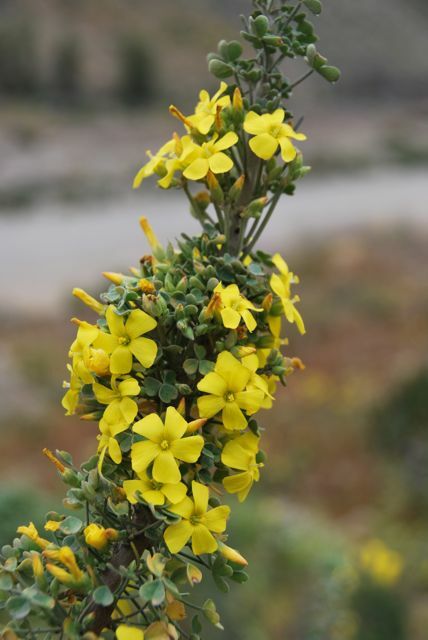 In Chile, it is known "Yerba de la perdiz" or "rimú" (indigenous language). In Brazil it is known as "azedinha de perdiz". 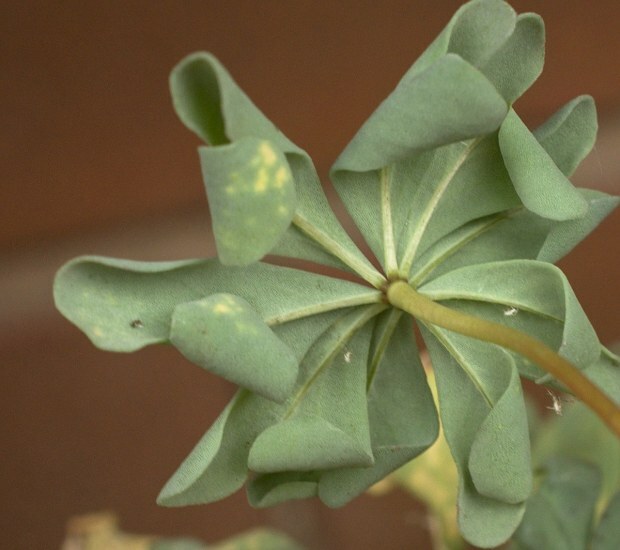 The leaflets are unusual in that one lobe of the leaflet stands up looking like Mickey Mouse ears, giving a very 3-dimensional appearance to each leaf. 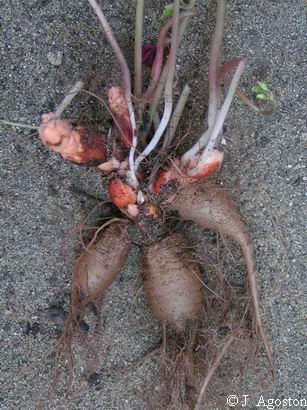 The bulbs are covered by a soft tunic. 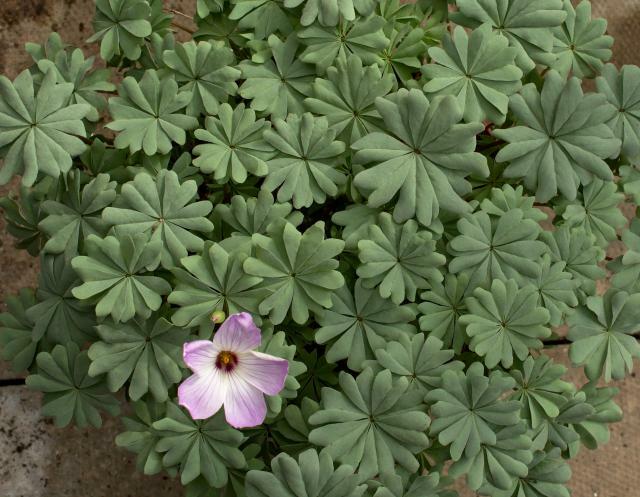 This plant is suitable for outdoor planting in the appropriate climate since it can withstand several degrees of frost and does not seem to spread readily. 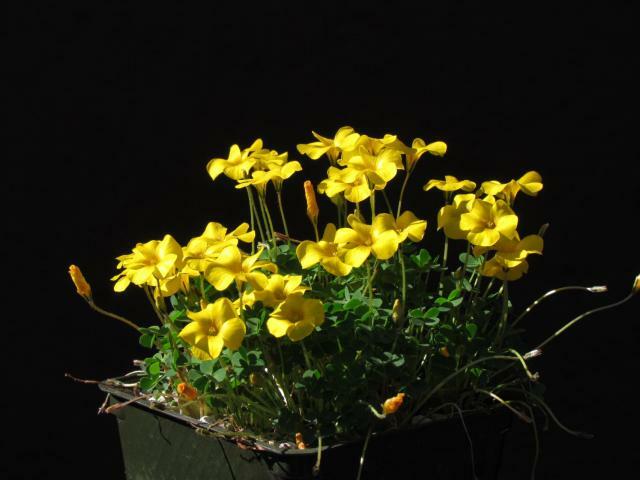 Planted somewhat thickly, it produces a wonderful show of golden yellow and on warm days waft a lovely scent of honey. 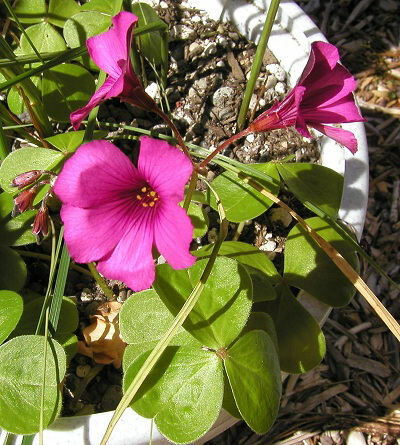 Oxalis perdicaria var. perdicaria (Molina) Bertero is the type variety of this species. 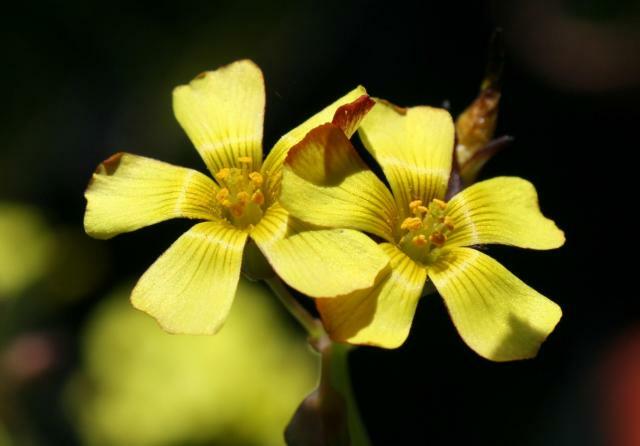 It is what we commonly known as the common bright yellow form that is honey-scented. 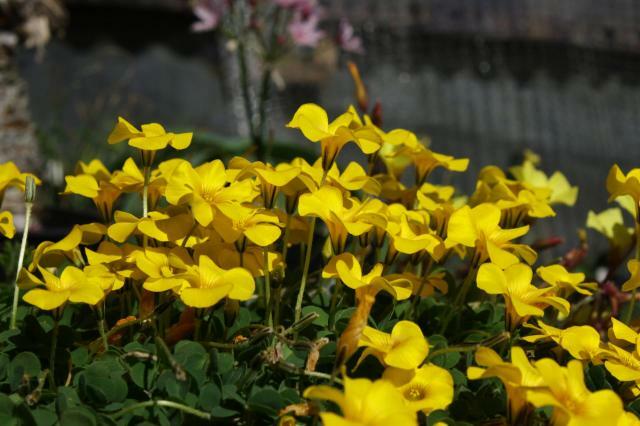 The bulbs should be planted in early summer because they are one of the first bulbs to break dormancy of the bulbous Oxalis. 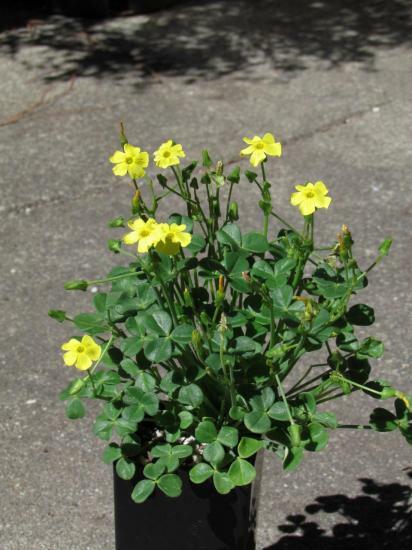 Plants can be grown as any other bulbous Oxalis species. Photos 1-2 were taken by Bill Dijk photos 3-5 were taken by Mary Sue Ittner. 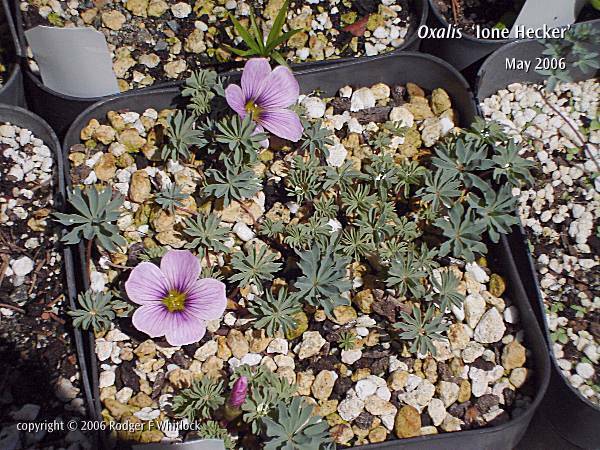 Photo 3 shows plants in bloom in October 2004 purchased as Oxalis lobata from Telos Rare Bulbs. The flowers are such a bright yellow, almost covering the leaves. Photos 4-5 by Nhu Nguyen shows the same form. The photos below were taken by Mary Sue Ittner. 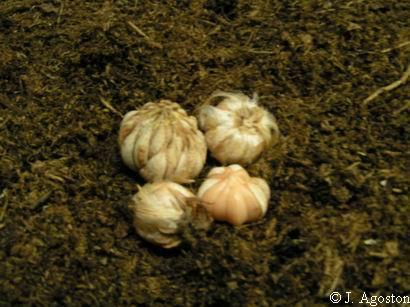 Photo 1 shows the bulbs on a 1 cm grid and photo 2 shows the shoot from the bulb as the dormant bulb starts into growth. 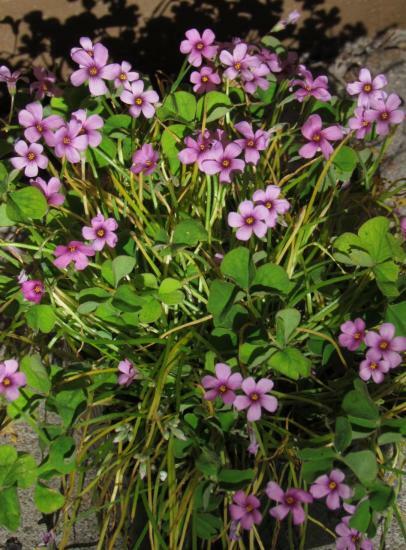 Oxalis mallobolba Cav. was made synonymous with O. perdicaria without varietal designation. 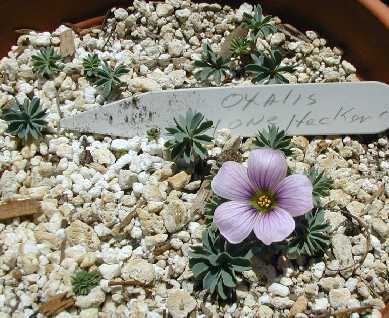 Here it is given a varietal name so that it will have a current name in cultivation. 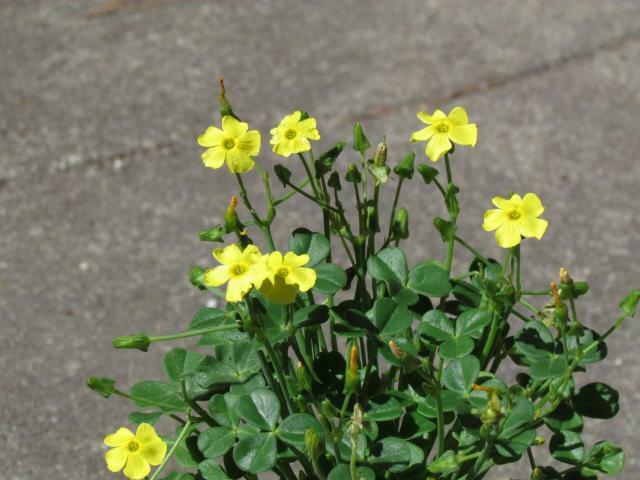 This variety can be distinguished based on its light yellow color of the petals along with red nectary guides. 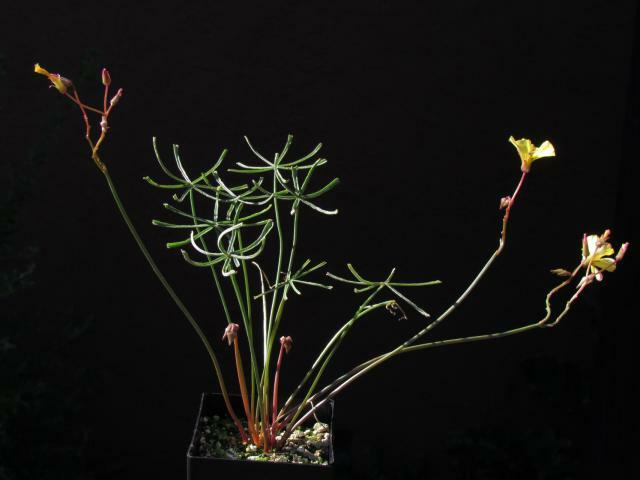 Vegetative aspects of the plant fits well within the definition of the species. The photo was taken by Nhu Nguyen. 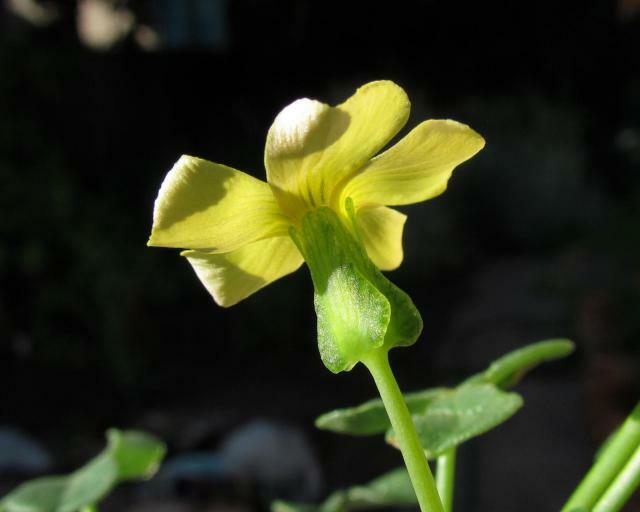 Oxalis potamophila is native to higher altitudes of southern Brazil. 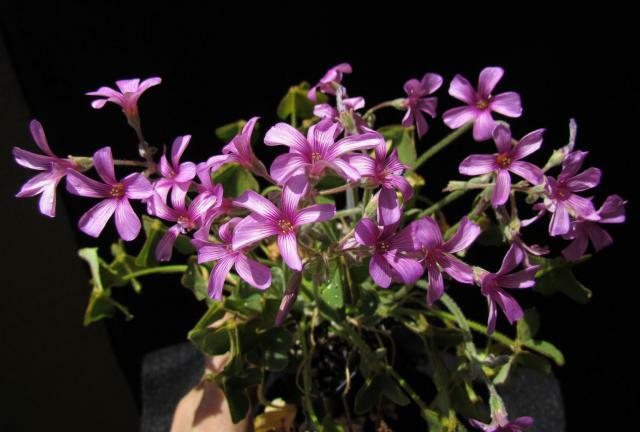 The name potamophila means "liking potable water". The species is summer growing and winter dormant. Photos by Nhu Nguyen. 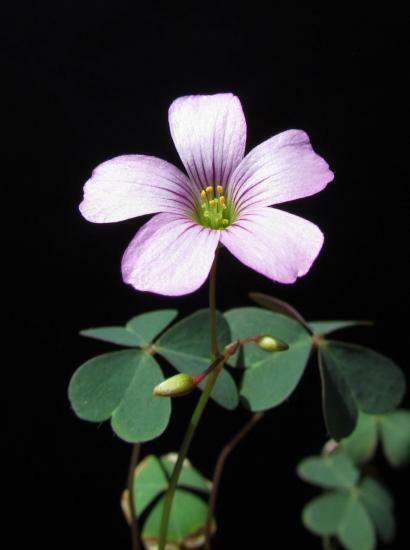 Oxalis spp. 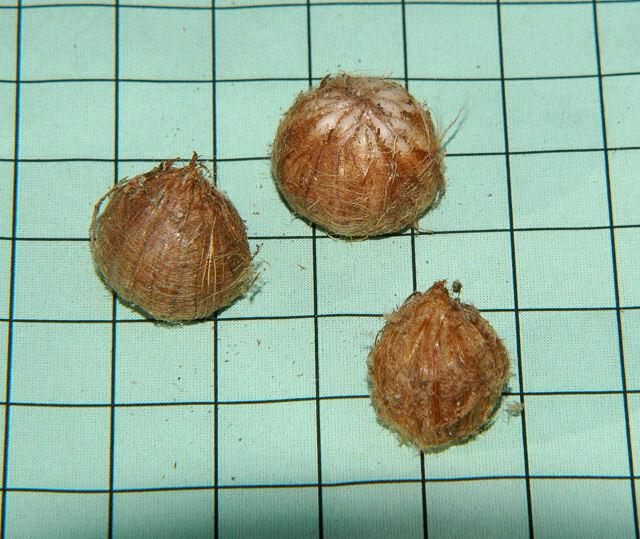 Below are photos of unidentified South American species. 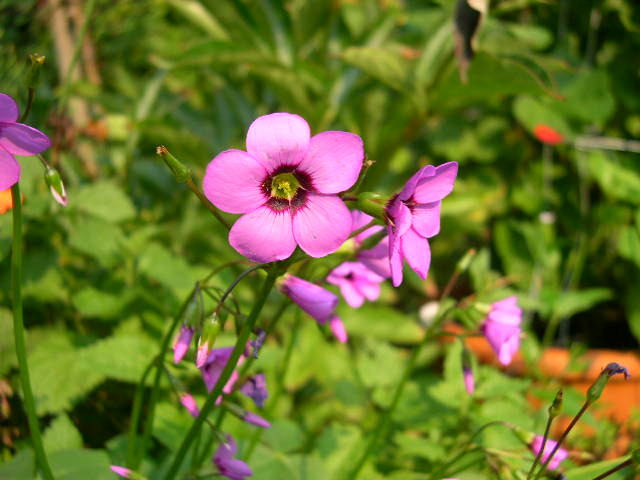 Oxalis sp. 30602 blooms in summer with large pink flowers with aubergine deep purple centres and a green eye in the middle. 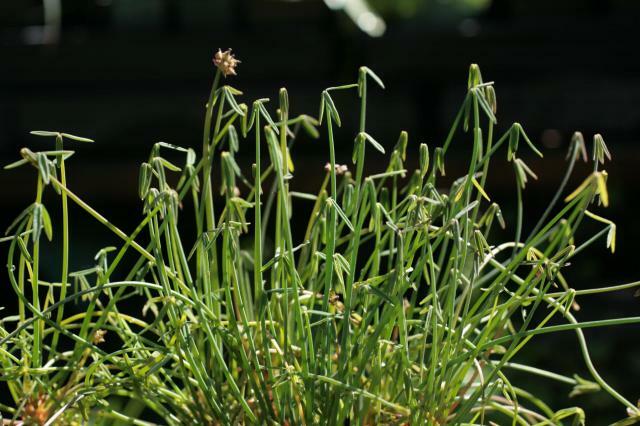 It has multiflowered scapes high above the foliage and flowers a long time. It is dormant in winter. The bulbs were given to me several years ago by a very friendly gardener of the Göttingen Botanical Gardens. Photos by Johannes-Ulrich Urban. 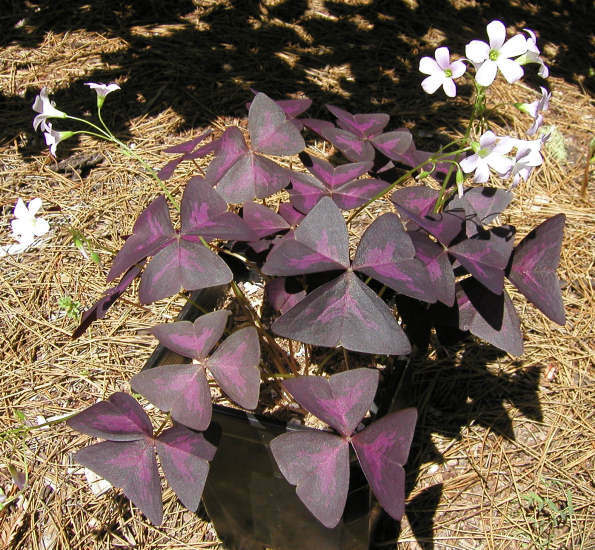 This plant looks very much like a picture of Oxalis elegans which Clifton says is found in Peru. 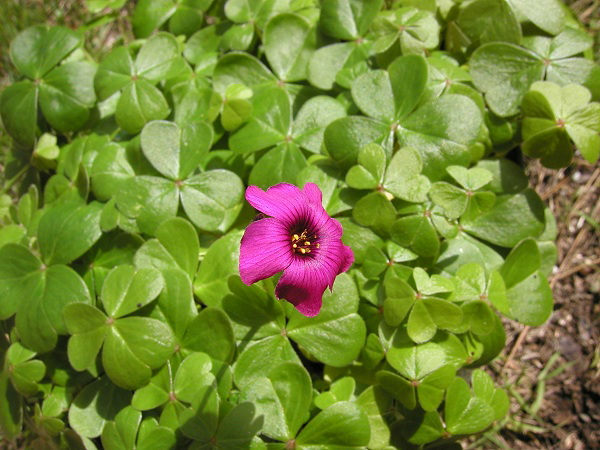 Oxalis spp. Chile the photos below are of species seen and photographed in late September and early October, 2011 by Eugene Zielinski in Chile of the flowering desert. 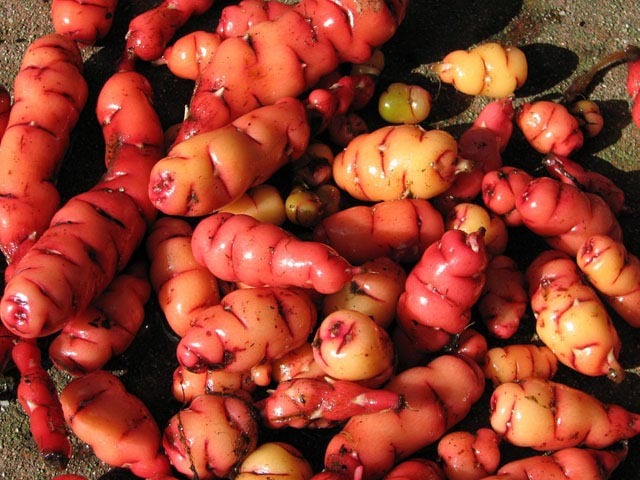 Some of them are probably tuberous. The first two photos show an interesting species with fuzzy flowering stems, photographed near Taltal. 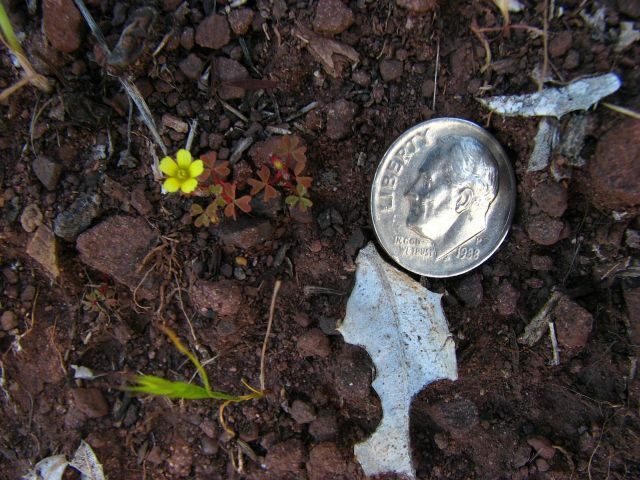 Photo 3 is of a very small species at the Pichasca National Monument. 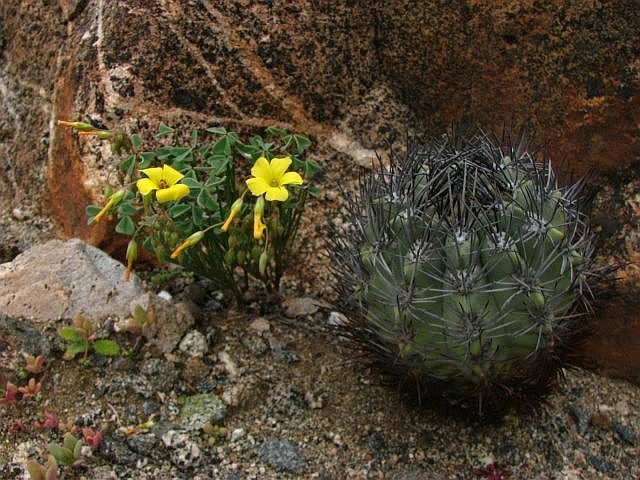 In photo 4 a plant is growing with an Eriosyce cactus. You can see the tubers in this photo. The last plant was growing in the Paposo area. 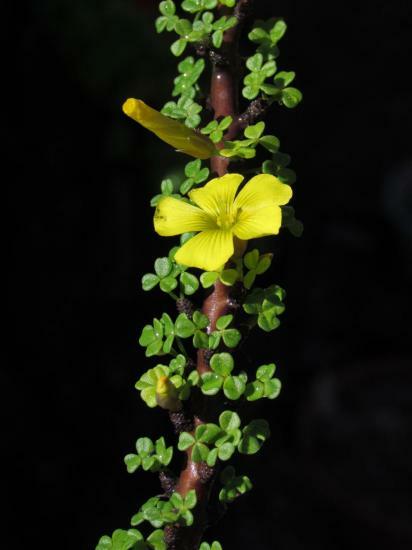 The stick to the left of the flowers is actually the plant's trunk. 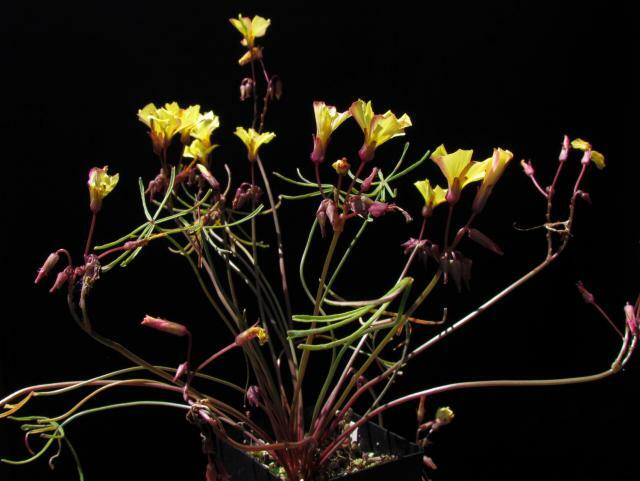 This Oxalis is probably not a geophyte. 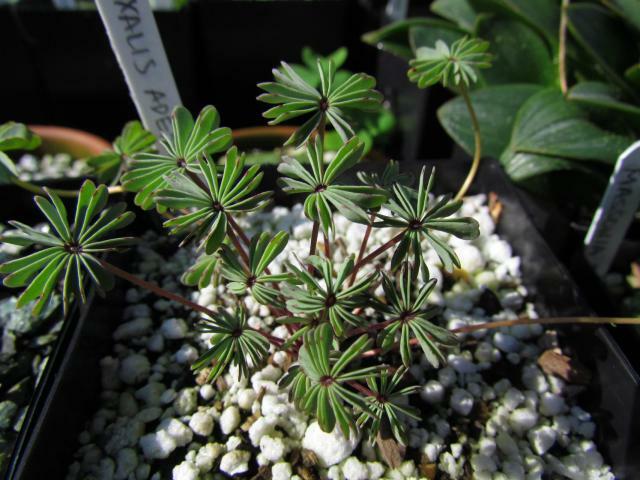 Oxalis sp. Santiago The photos below were taken by Nhu Nguyen of a plant in cultivation, from Santiago, Chile. It is summer growing and winter dormant. The leaves have a beautiful architecture and nice spotting. 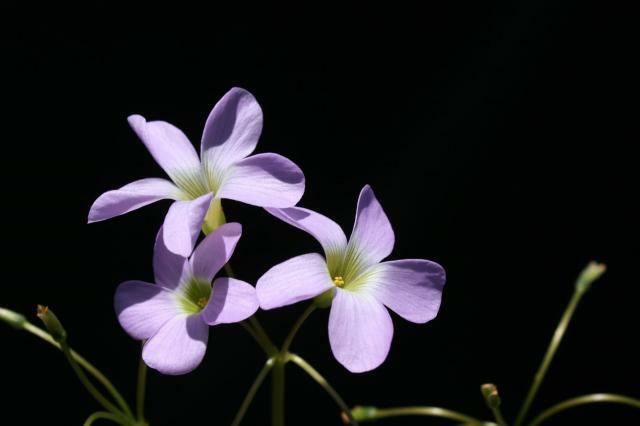 Oxalis sp. 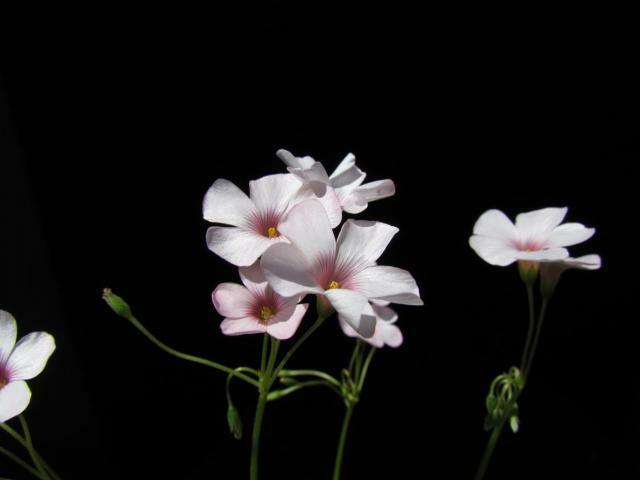 The photo below were taken by Nhu Nguyen of a plant in cultivation from an unknown location. 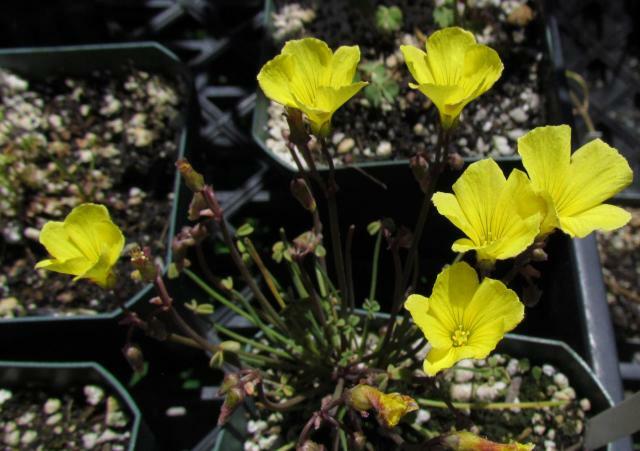 However, based on the identify within Section Carnosae, this plant was probably native to Chile. 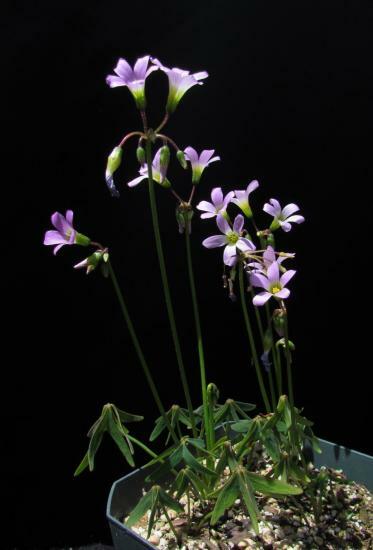 Based on Alicia Lourteig's monograph (2000) on Oxalis and the most recent literature up to date (2013), this species could not be identified and thus probably represents an undescribed species. 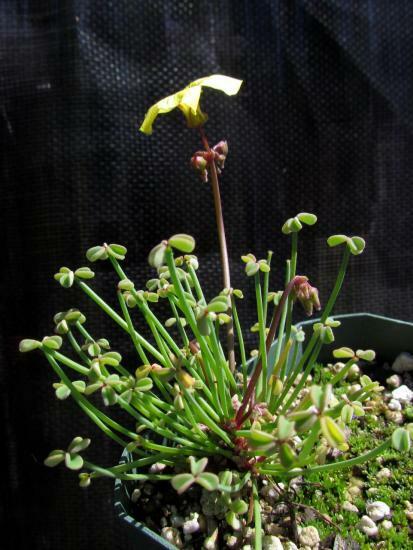 Oxalis tortuosa (syn. 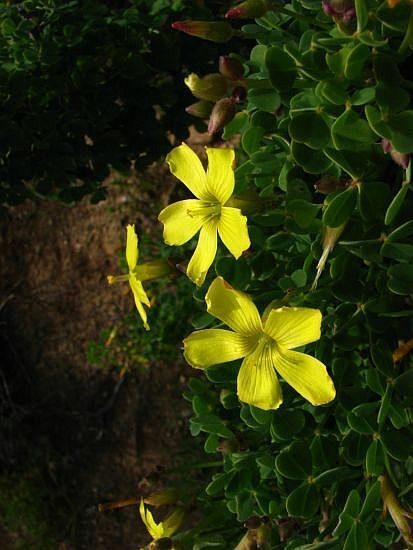 O. maritima) is native to central Chile. It is characterized by long petioles with small and almost linear leaflets at the end. 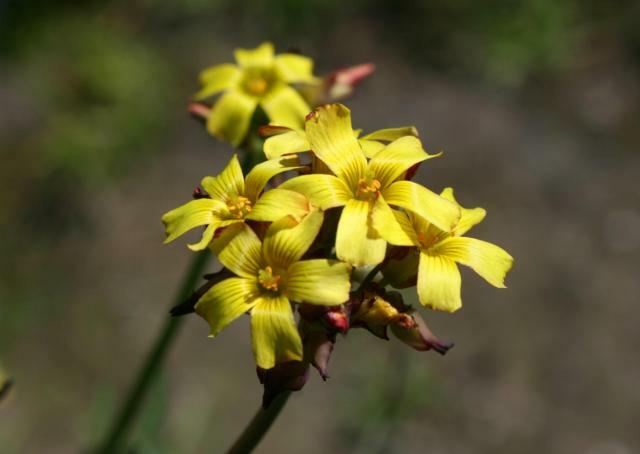 The flowers are tiny and are formed in a dense inflorescence. 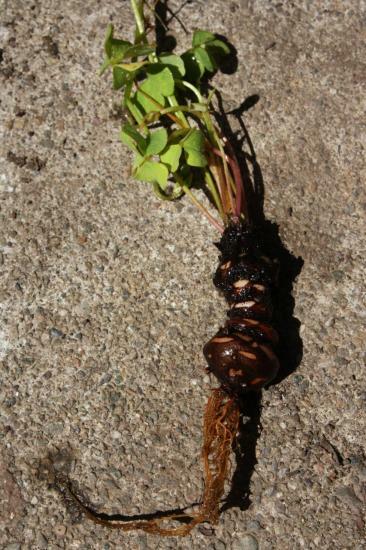 The roots are thickened, much like a carrot. 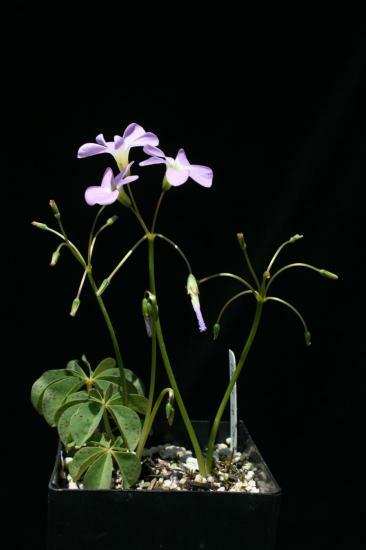 In habitat, the plant will go dormant in the summer and return to growth with the winter rain. In the San Francisco Bay Area, if water is given year round, this plant does not drop its leaves. Photos by Nhu Nguyen. 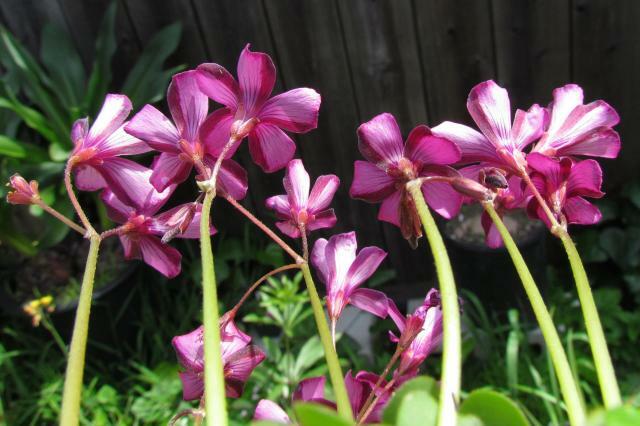 Oxalis triangularis is native to lower altitudes in wet fields, marshes, and banks of streams in Brazil, Bolivia, Paraguay and Argentina. 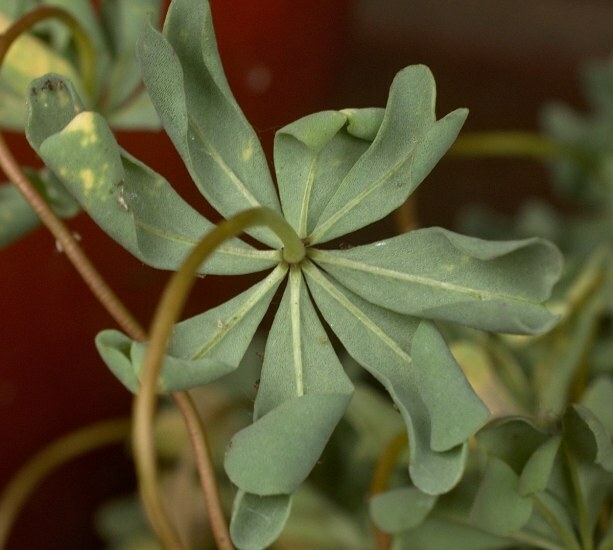 This species has been very successful in cultivation and has become one of the most common houseplants. A common and beautiful form has leaves flushed wine red to purple with a zone in each segment. 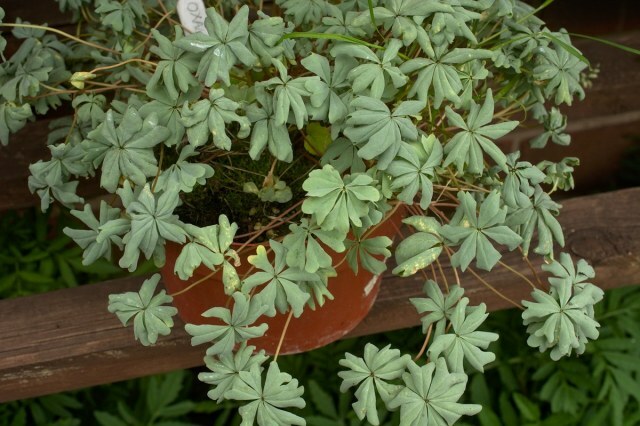 This plant can be kept growing continuously if it is watered regularly and makes a fine houseplant. Photo 1 by Bill Dijk. 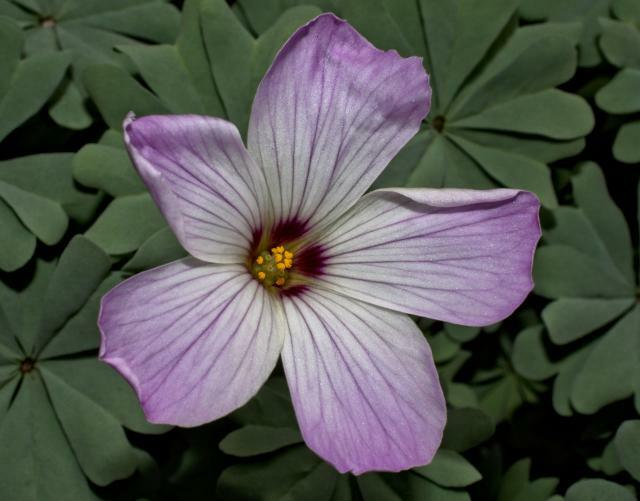 Photo 2 by Bob Rutemoeller shows the attractive leaves and flowers. Water was withheld so the rhizomes could be shared with others and dormancy induced. 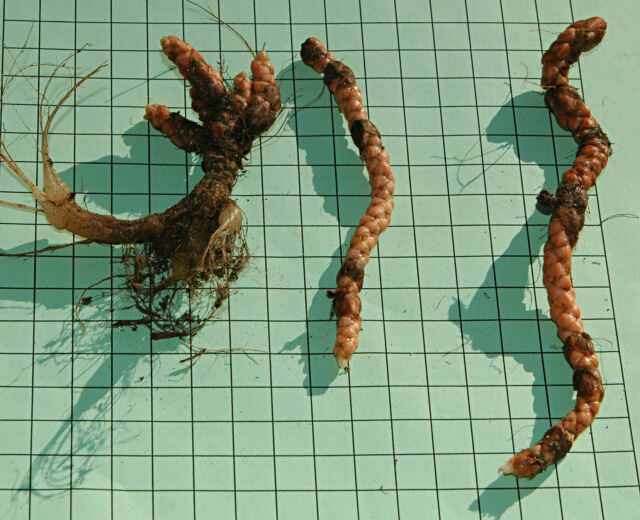 Photo 3 by Mary Sue Ittner shows the rhizomes displayed on a 1 cm grid. The one on the left still has the remnants of the succulent contractile roots that are present when the plants are in active growth. The last photo from Janos Agoston shows this more clearly. Oxalis tuberosa see the Oxalis tuberosa page. Representative photos of this species. Photos by Nhu Nguyen.